Research on a now-defunct pigment conducted within Buffalo State’s Patricia H. and Richard E. Garman Art Conservation Department was included in an article in the September 3 issue of the New Yorker magazine. In the article, “Blue as Can Be,” writer Simon Schama examined the long-lasting power of color, focusing on the Forbes Collection in the Straus Center for Conservation and Technical Studies at Harvard University. He looked at the science behind creating specific hues, meandering through centuries, artistic periods, and the mysteries behind some famous pigments. Schama noted that Buffalo State Art Conservation faculty members Rebecca Ploeger, assistant professor, and Aaron Shugar, Andrew W. Mellon Professor, recently discovered new evidence that supports an extraordinary nineteenth-century eye-witness account of the production of the pigment known as Indian Yellow. “The hippuric acid discovery supports the original nineteenth-century accounts that urine is used in the process of making Indian Yellow,” said Ploeger. This research was conducted over the past several years in collaboration with two researchers at the Indianapolis Museum of Art at Newfields. “Incidentally, one of those researchers, Gregory Dale Smith, taught conservation science at Buffalo State before moving to Indianapolis,” Ploeger said. The scientific paper summarizing the researchers’ findings appears in the January 2019 issue of Dyes and Pigments. 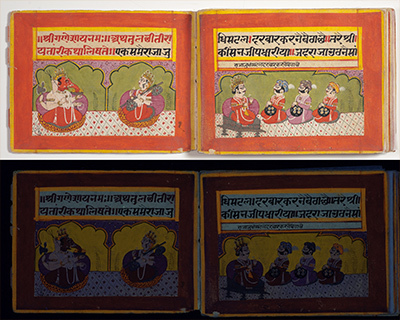 Pictured (inset): Visible and UV-induced visible fluorescence images of a Hindu manuscript (69.25.1) from the Indianapolis Museum of Art at Newfields. 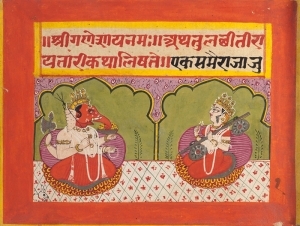 The bright yellow fluorescence indicates that Indian yellow pigment has been used in the yellow borders and mixed with indigo in the green fields. Photo courtesy of Newfields.